This is the third installment of the 8 easy-to-make networking mistakes that can be avoided series. This week’s mistake is: I didn’t know what I didn’t know, so much so that I didn’t have a clue what to ask my coach for help with. My coach had built a successful business, in large part to her networking and follow-up. And she had faced many of the same problems and frustrations as I was facing. However, all her knowledge and experience couldn’t help me when I didn’t know what to ask. I listed “I didn’t know what I didn’t know” as a mistake, but actually it’s not a mistake as much as it is part of the learning process. It’s something to be expected and even celebrated (if you wait until you’re sure you have no blind spots, aka perfection, you’ll never start). If I had realized how many mistakes I was making, I probably would have gone and hid under the covers. 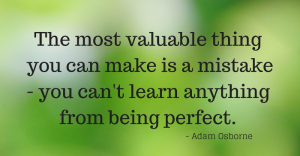 The only mistake here is NOT taking the opportunity to learn from your mistakes when you realize you made them. Don’t worry about them or beat yourself up, just learn from them and move on. And I’m thankful that I did have a coach who was able to help me be as prepared as I was. I’d have many more “mistakes” to share without her support and guidance (regardless of the questions I didn’t know to ask). 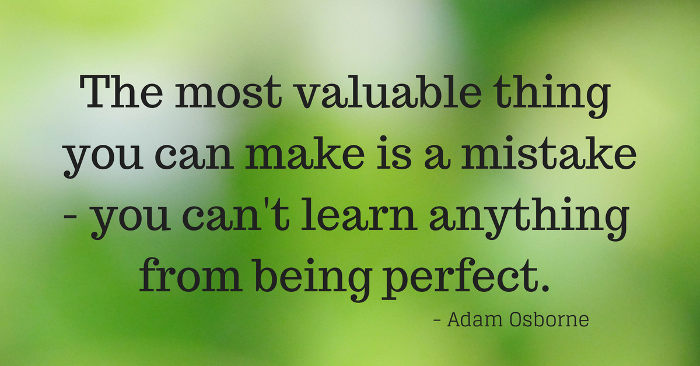 Recognize that you’re going to make mistakes AND that is OKAY. Have a coach to support you and help you be prepared. Share some of the things you didn’t know you didn’t know about business or networking in the comments below!